If you ever wanted to own the home where everyone will gather and be entertained for parties big and small, this is it. Photograph the bride on the double turned staircase in the foyer, have the fund raisers and family gatherings at your house. 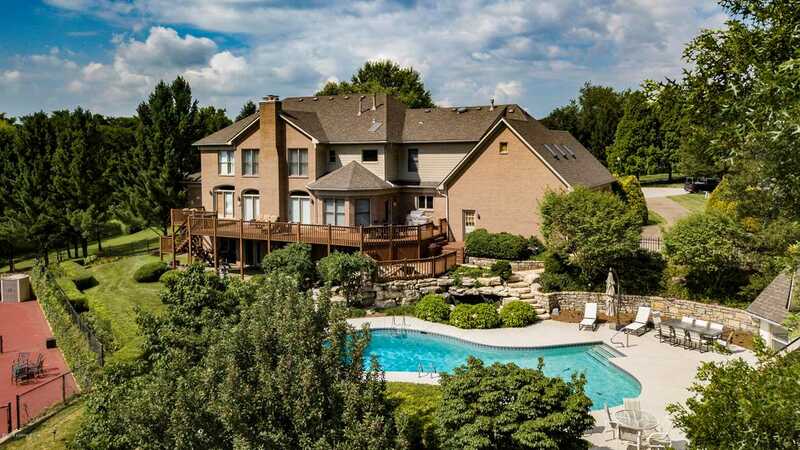 With nearly 10,000 sqft on a 1.1 acre fallaway lot including a pool, pool house and tennis court, this home is set up to make a lifetime of memories. The 21-foot tall ceiling in the marble foyer boasts a 5' long crystal chandelier. To the left is the formal dining room. The back of the house is less formal and consists of a huge updated kitchen and very spacious family room. The laundry/mud room is huge located just off the 4 car garage has direct access to the lower level via a a stairway. and attached to the kitchen. The garage has direct access to the lower level via a stairway. The formal living room has its own fireplace, hardwood floors, and a floor-to-ceiling bay window. It was a home to a full-size grand piano without feeling a bit crowed, so placement of furniture will not be an issue. Walk through two French doors into the executive office that showcases a coffered ceiling, built-in shelves, and hardwood floors. Two newly installed large side doors open up to an oversized deck which is located along the back of the home. There are two commercial grade car that will stay with the home if the buyer wishes. The car lifts convert this garage space into a six-car garage. There is also a 5th car garage located on the back of the house; it is over-sized and can be used to store lawncare equipment or a 5th car. This home has two master suites. Lot Size: 1.12 Acres / 48787 Sq. Ft.
SchoolsClick map icons below to view information for schools near 7507 Pine Knoll Cir Prospect, KY 40059.